It appeared in reality as if summoned from dreams. Moving gears, matching white suits, fresh flowers whose fragrances meshed discordantly with elevated bar food, and share plates. Could it be? 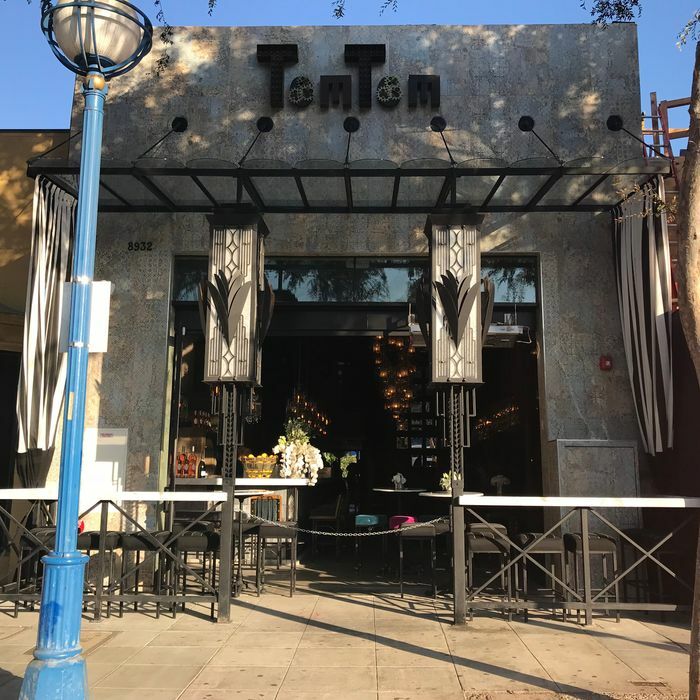 Tom Tom, the new Lisa Vanderpump bar and restaurant proposed at the end of Vanderpump Rules’ fifth season and built (with much turmoil and sweat equity) throughout its sixth, existed. And I was there. The journey to Tom Tom was a difficult one, mainly for Tom Sandoval and Tom Schwartz, but also for me, who had to convince Vulture-dot-com that it was worthwhile to fly me across the country to go to a bar. But the drunken meetings, accidental flare-ups with Lisa, and hard-won “progress parties” were not for naught; Tom Tom — which is styled as two separate words, per Vanderpump PR (“Ken & Lisa have confirmed ‘Tom Tom’”) — opens to the public on August 9, 2018. “Obviously, it’s been very exciting,” Tom Sandoval told me, regarding the opening of Tom Tom. Believe me, I know. “And it’s been a lot of work, too,” he added. Believe me, I bet! I visited Tom Tom for a menu-tasting event on Monday night. The bar is situated in the same area of West Hollywood as Vanderpump’s other properties, none of which I’d ever visited, so I took the occasion to, before the tasting, visit Pump for a happy hour Pump-tini ($8). If you can picture it, I sat at the outdoor bar where Tom Schwartz once had a panic attack after working a half-day. If you can imagine it, I spent the duration of my stay talking to a handsome bartender who hopes to be an actor and who made me promise that our entire conversation remained off the record. It was perfect. Vanderpump Rules is special in that it is at once a truly great television show and a truly great theme park. The places where our favorite characters worked or still work, DJed or still DJ, fucked in the bathroom or allegedly fucked in the bathroom are visitable whenever we want. They, along with their goat-cheese balls and their Pump-tinis, exist wholly in reality. We are lucky for this gift. Luckiest of all, however, is me, Kelly Conaboy, because — as you are by now aware — I got to go to Tom Tom on Monday. Tom Tom’s interior does not disappoint. The elegant steampunk aesthetic, design notes mentioned throughout Vanderpump Rules’ sixth season, is articulated in the styling much better than the words “elegant steampunk aesthetic” would lead you to expect. Large-format clockwork and gears swing and spin continuously behind the front bar, where the ceiling is coated in various sizes of chandelier, many of which are encased in — I’m not sure how to better describe it — balls. Dotting the bar top are bouquets of fresh white flowers, which spread the scent of a funeral home freely and with abandon. Next to the bar sits a smaller “shot bar,” behind which are, like, a bunch of tubes and beakers burbling with liquid like it’s some sort of science lab. The seating is in a plush, tufted cerulean blue, and the backyard is decorated pleasingly, if incongruously, with a bunch of succulents. It’s a weird, beautiful, very funny space. The Toms, Ken, Lisa, and Giggy (Ken and Lisa’s dog) (not to insult your intelligence with this parenthetical, I do assume you know Giggy) arrived a bit after I did. Lisa’s daughter Pandora and her husband were already there, visibly working. Amazing. At this point in my life, it’s hard to imagine celebrities whose corporeal form would excite me more than the cast of Vanderpump Rules. Celebrities in general are very boring, and I don’t care about any of them aside from Domhnall Gleeson, whom I would like to marry. The cast of Vanderpump Rules, however, has provided me with hundreds of hours of entertainment simply acting as exaggerated versions of themselves, and I would love to hang their autographs in my living room. Of course, Tom Sandoval and Tom Schwartz arrived on a motorcycle and sidecar wearing matching three-piece white suits and helmets labeled “T. Sandy” and “T. Schwa.” They’d arrived in the same way the night before, for an opening party with the cast that was filmed for the show. It was a very warm look for a mid-90s August day, but the boys — very handsome in real life, I have to say — wore it somewhat well. To ensure the prospect of an interview before any of us blacked out, I asked Sandoval if he might set aside a few minutes to talk to me later on. He said he and Schwartz would find me after he had a drink and a smoke. Amazing. In the meantime, my friend and I sat in the open-air backyard, which overlooks a basketball court and dog park. Here we sampled a few Tom Tom food offerings and many Tom Tom cocktail offerings, while I freaked out at the sight of Lisa, who was walking around socializing, and Ken, who was carrying Giggy and who would often take moments to himself, away from the group, to kiss and talk to the tiny dog. It was very sweet. Our server’s name was JoJo, which I hope is a theme with the servers. (My Tom Tom name would be “KellKell,” for example; you’ll have to figure yours out on your own.) The food was all absolutely fine — elevated bar food, indeed — save for an olive fried in a style similar to a jalapeño popper that was served with a jalapeño aïoli. Another Tom Tom guest insisted that I try this snack, I assume as a prank. Please — do not order the crispy fried olives. Instead, order the “Bubbapump Shrimp Jicama Tacos” or the “Citrus Sesame Shishitos.” Each of these dishes carries my stamp of approval. NOT the olives. My friend and I ordered just about every cocktail Tom Tom had to offer (the “Clockwork Pink,” the “Toulouse Your Mind,” the “Tom Fashioned”) and, yes, my friend spent the majority of the next day vomiting. (I only almost vomited.) All of the drinks were beautiful — my favorite was the “Alchemy Rose,” a hibiscus, ginger, and gin drink — and many arrived with little flowers in them or decorative coatings around the glass (bee pollen, coconut) that get your hand sticky if you accidentally touch the wrong part. This was not an issue for me, but a woman sharing our table stickied her hand with the bee pollen at one point and requested a damp napkin from JoJo to unsticky herself, which shocked me. I would never in my life think to request a damp napkin from a waiter. 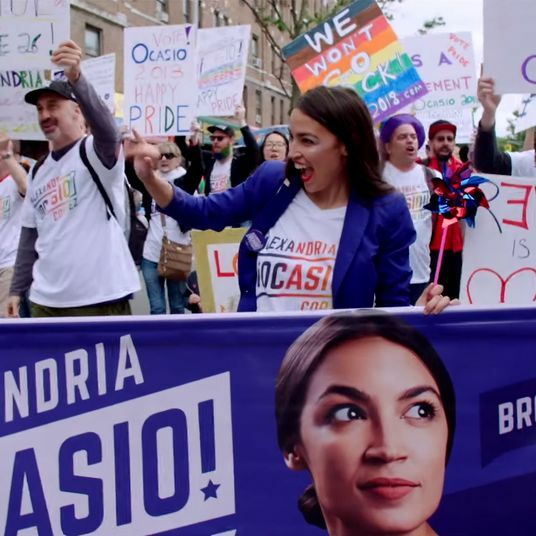 It reminded me of a time I heard an old roommate of mine request that someone at a photo-printing store put a border around her head shot before printing it out. (The store offered no such service.) I’m honored and frightened to have been in the presence of their bold requests. Also, while we’re still on the cocktails, the stemware was nice. “Villa Blanca is where you bring your wife, SUR is where you bring your mistress, and Tom Tom is where you go to forget about both,” Tom Sandoval told me, and I assume everyone else he spoke with on Monday night. (It’s not an unclever addition to Lisa’s quote, you have to admit.) He and Schwartz took me out the service entrance to chat, where I was struck again with the fact that they are both very handsome. I asked them what they’d been doing in the lead-up to Tom Tom. I pointed out that Tom Tom was like Jurassic Park in this way, the sparing no expense, and the idea was met with much excitement. “IT IS!” said both Toms. “That’s awesome; that’s really high praise. That’s a great compliment,” said Sandoval. “It’s an experience. It’s an adventure. It’s a break from reality. I want people to be able to come here and just forget about their problems,” said Schwartz. That is, arguably, one way to describe what happened to the visitors of Jurassic Park. “— James Jax?” offered Schwartz. During the reunion episodes after the conclusion of the show’s sixth season, Lisa revealed that she had not yet cashed the $50,000 checks that made the Toms 5 percent stakeholders, a fact that seemed to shock them. I asked, in the months since, has Lisa cashed the checks? Speaking of shots, “Can we take you to the shot bar and have a shot?” Oh my god. Never in my life did I think I would have the good fortune to be invited for a shot with Tom Schwartz and Tom Sandoval at Tom Tom — typing the sentence gives my chills, as I assume reading it does for you — but I suppose one of my eyelash wishes came true. We went to the shot bar where Schwartz asked, “Can we take a picture?” and Sandoval replied, “I’m gonna take a video,” before handing his phone to the bartender behind the shot bar. We took a shot — something guava related — and Sandoval AirDropped me the video. “You’re one of the first people to do a shot with the Toms in Tom Tom,” said Schwartz, an accolade I will be adding to my résumé and tombstone and email signature, and one which I will consider tattooing on my arm in the style of “It’s all happening.” Thank you to my friends Tom and Tom; I will never forget you. After taking the shot, while standing alone with Sandoval, I decided I should probably ask him about his Charles McMansion bandmate Isaac Kappy’s association with QAnon, as the story had just broken earlier that day and I am ostensibly a reporter, though more accurately, I am just a simple Vanderpump Rules fan. Had he heard about this? Does he even still talk to that guy? “I WOULDN’T COMMENT ON THAT,” boomed a voice from behind, scaring me. “NO. DON’T COMMENT ON THAT. You don’t know what he’s been doing. No, don’t comment on that,” he said to Sandoval, who also seemed alarmed. Who is this benevolent stranger who seemingly hates comments? “I’m his publicist, by the way,” the stranger said. Ah, yes. Still, Sandoval gave a light comment, as he was now my friend and even publicists cannot get in the way of friendship. Fair enough. I left and ended up in conversation with Pandora at the bar. I then ordered a drink and Pandora’s husband brought it over to where I was seated, which was on a cerulean-blue fainting couch. Later, I asked Ken for a photo with him and Giggy, and he obliged. If you are very lucky, there will be a moment in your life when you take a step back and think, I did it. For Tom Sandoval and Tom Schwartz, I imagine the moment came this week. For me, the moment came when I arrived outside of Tom Tom. 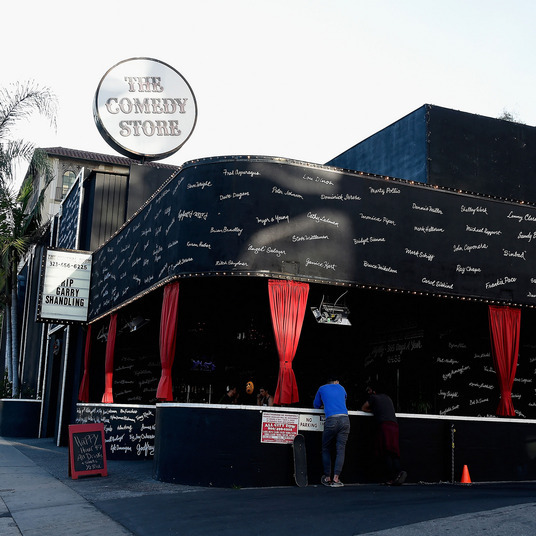 For you, well, I can only guess that for you the moment will come on your next trip to Los Angeles, when you arrive — finally, after a long journey, tired and thirsty but happy all the same — at the shot bar within Tom Tom where Kelly once took a shot with Tom and Tom.